"Let me introduce myself. 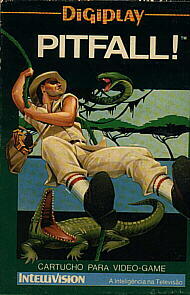 I´m Pitfall Harry, veteran jungle explorer. Fortune hunting´s my game, and yours, too, if you´re daring enough to take this trip. Now, don´t be nervous. I´ll be your guide through the jungle, and I´m one of the best." "Untold riches are waiting for us in there, but so are dangers a dozen times over. We´ll be swinging on vines over bottomless tar pits. We´ll be hopping across swamps using crocodile heads like stepping stones. We´ll be searching underground through dark passageways crawling with killer scorpions." "So pack up your backpack and meet me in the jungle at dawn. We´ll be off to seek a king´s ransom in gold, diamonds and lost treasures - in Pitfall Harry´s Jungle Adventure."